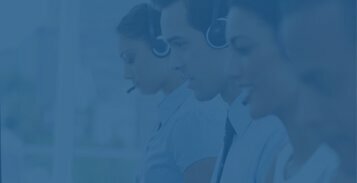 World’s Fastest Growing Call Center Software. Try the hosted dialer that managers trust and employees love to use. How will we help your business grow? 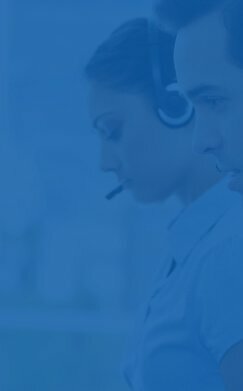 Expand your company’s reach and maximize your agents’ performance with cost-effective call center software from CallTools.com. From precise preview dialing to intelligent predictive dialing, we offer an option for your business. Our virtual call center software keeps agents connected to customers no matter their location or the size of your workforce. Make more calls, increase profits, and exceed customer expectations. 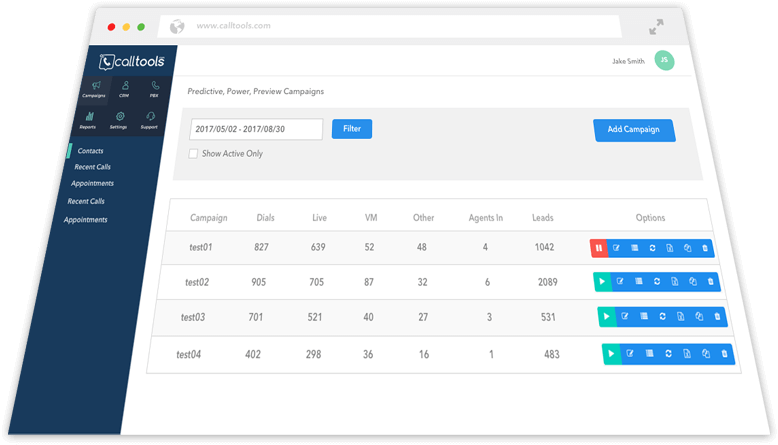 Monitor total calls and remaining leads in your active campaign, right from your dashboard, updated in real-time. Integrated web phone allows you to connect directly to the dialer and take inbound calls from anywhere in the program. With the integrated web phone, agents can take calls directly inside the platform, from any location in the program. As simple as logging into the platform, connecting to a campaign, making your status available, and dialing. Compose an email, schedule appointments, and view all activity in the contact toolbar. 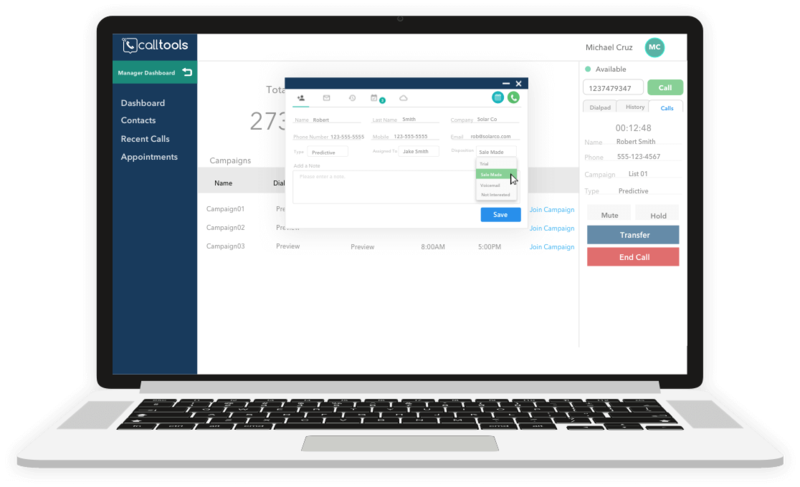 CRM built into the software helps manage contacts and organize campaign efforts. 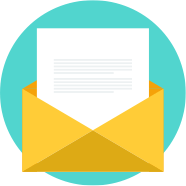 Push contact details to your third-party CRM, view their business on Google Maps, and more. Quickly sort campaigns by dates run and activity status for easy organization. Quick access to add a campaign makes the process fast and simple. Stay informed on performance with campaign stats laid out in your dashboard. Start, pause, edit, duplicate, recycle, or delete campaigns directly from the dashboard. Manager seat is included with purchase, allowing you to monitor your contact center’s performance in real-time. No additional fees when you use the platform as virtual call center software to keep all your agents connected. Cloud-based, hosted solutions offer speed and reliability, as well as simple and affordable setup and maintenance. Integrates with third-party CRMs so you do not lose your data when switching dialing platforms. 10 channel dialing capability included for each agent with our Predictive and Power dialing solutions, up to 30 channels available. 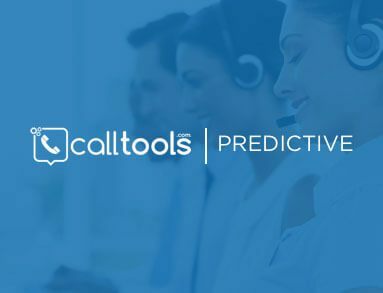 Maximize agent productivity at your call center with CallTools.com’s Predictive Dialing solution. Using a hosted predictive dialer boosts lead reach by 500%, allowing you to contact more leads in less time. Make and receive calls from the integrated Web Phone, analyze agent performance in real time with Live Agent Monitoring, and keep track of metrics with Real Time Reporting. 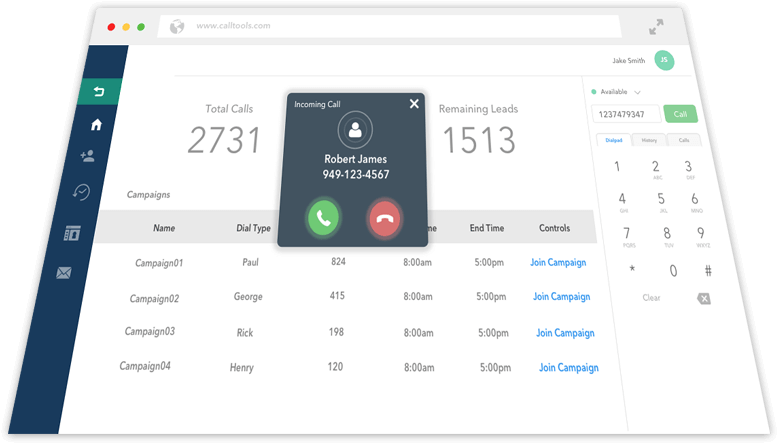 With the cloud-based Predictive Dialer from CallTools.com, there is little need for extensive hardware and virtually instant set-up. 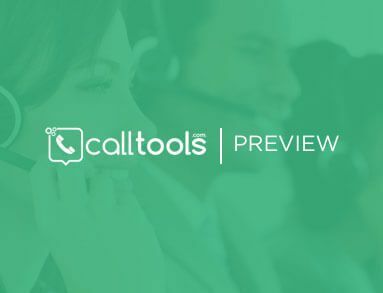 Simplify and organize your calling with the CallTools.com Preview Dialer. Search for a specific contact or scroll through them one-by-one, then call them with a single click. Their information populates on the screen, keeping you informed on every contact you call. 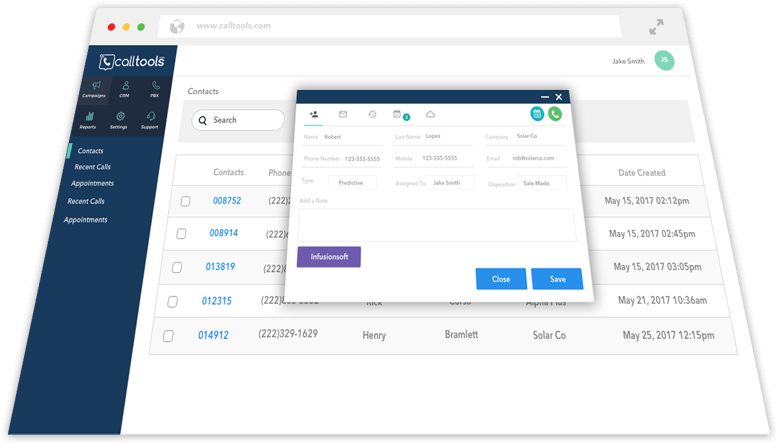 Export call logs and contact information into your third-party CRM with a wide range of integrations. The user-friendly, distraction-free dashboard makes it easy to stay focused on dialing. The cloud-based system requires little to get started.